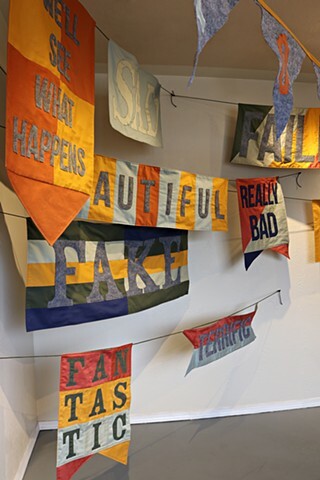 The Likes of Which You’ve Never Seen Before is an installation of pennants and banners sewn from fabric and felt, each displaying a word or phrase habitually repeated by Donald Trump. The pieces hang all across each other and the space, mirroring the messy circus of repetitive language pouring out of the Trump administration each day. The work highlights how words can lose their meaning and impact when they are used so frequently as bombastic rhetoric, and how the repetition of these once ordinary words has created an unavoidable association with Trump whenever they are heard, no matter the context.